Asiatic dayflower (Commelina communis) is a weed that’s been around for a while but is getting more attention as of late. This is, probably, because it’s so resistant to commercial herbicides. 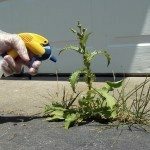 Where weed killers wipe out other pesky plants, dayflowers charge right ahead without any competition. So how can you go about controlling dayflowers? Keep reading to learn how to get rid of dayflower and how to go about dayflower weed control. Control of Asiatic dayflower is tricky for a number of reasons. For starters, these common dayflower weeds are resistant to many weed killers and can regrow easily from broken stems. It can also sneak up on you, looking like wide leafed grass when it first sprouts. The seeds can remain viable for up to four and a half years, meaning even if you think you’ve eradicated a patch, the seeds can be stirred up and sprout years later. And to make matters worse, the seeds can germinate at any time of the year, which means new plants will continue to sprout even as you kill the more mature ones. With all these obstacles, is there any hope for dayflower weed control? It’s not easy, but there are some methods for controlling dayflowers. One reasonably effective thing to do is to pull the plants out by hand. Try to do this when the soil is moist and workable – if the soil is hard, the stems will simply break off from the roots and make room for new growth. Especially try to remove plants before they drop their seeds. There are some herbicides that have been proven to be at least somewhat effective in controlling dayflowers. 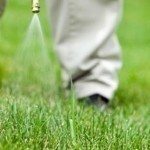 Cloransulam-methyl and sulfentrazone are two chemicals found in herbicides that have been found to work reasonably well when used together. Another method that many gardeners have adopted is to simply accept the presence of Asiatic dayflower and appreciate the plant for its delicate blue blossoms. There are certainly worse looking weeds.